The Big Advice Survey has launched – Get involved and tell YOUR story! There have been unprecedented changes to the Social Welfare Law (SWL) advice world, with legal aid cuts, welfare reform and approximately 60% more cuts on their way. Because of this, there has never been a more important time to have YOUR say and get involved with the Big Advice Survey. By drawing upon common issues that North Somerset has with other counties, it will provide a powerful tool to make our voices heard on a national level. The Big Advice Survey is a national survey conducted at a local level. It looks at how we deal with problems in our daily lives and where advice fits in. It also explores the potential for alternative ways of delivering advice services as well as a range of other areas e.g. the relationship between advice and health. The Big Advice Survey is collaborative, created and promoted by individual Citizens Advice Bureaux and Law Centres and an incredibly diverse range of other organisations including solicitor firms, community groups, local businesses, foodbanks, housing associations, colleges and educational institutions. 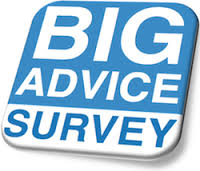 The Big Advice Survey went live on Monday 1st December 2014 and will run until the end of March 2015. It is the largest UK-wide front-line service collaboration for many years. Follow the link. The survey will take about 5 minutes to complete. If you wish to know more about the Big Advice Survey and see a promotional one-minute video, please visit their website.